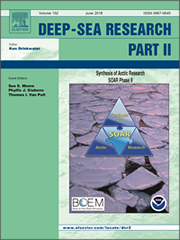 The SOAR project is pleased to announce the publication of its second and final Special Issue, now available as Volume 152 of the journal Deep-Sea Research Part II. This new special issue features 15 full synthesis research papers, plus an Introduction paper that provides highlights and context. The special issue brought together 74 scientists from 41 institutions in ten different countries to provide environmental information on the rapidly-changing Pacific Arctic region through an integrated, synthetic approach. Please visit the SOAR Phase 2 page for more information. The Synthesis Of Arctic Research (SOAR) brings together a multidisciplinary group of Arctic scientists and residents to explore and integrate information from completed and ongoing marine research in the Pacific Arctic. effectively transmit findings of the synthesis to local residents, resource managers, science societies, and the general public. The first phase of the synthesis resulted in a special issue of Progress in Oceanography, volume 136, published in August 2015. The second phase of SOAR developed a series of new synthesis papers, published in June of 2018 in a special issue of Deep-Sea Research Part II as volume 152.